Are you looking for the full official rules of table tennis or just the basic rules? Well, I've got them both covered here. The official table tennis rules are a comprehensive set of rules and regulations which are designed to cover any eventuality which may arise during a game. 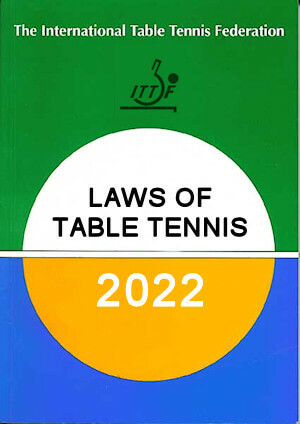 These rules are reviewed annually by the International Table Tennis Federation (ITTF) and any changes are normally implemented with effect from 1 January of the following year, unless another date is specified. 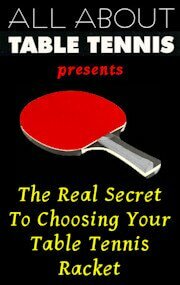 However, if you're a beginner, you only need to know a few of the basic rules of table tennis in order to play a game with your friends. 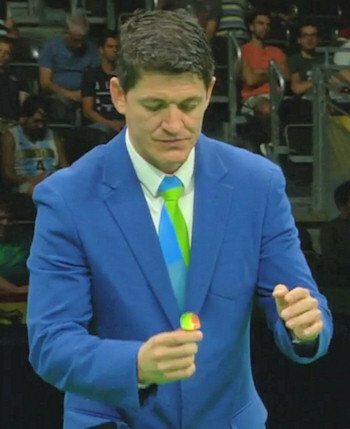 Well, I've been playing, organising and writing about table tennis since 1971, and I'd love to share my knowledge of the rules with you. So, on this page I've explained the basic rules, but you'll also find links to my other pages which explain the rules in more detail. The basic rules of table tennis, or to give them their correct title - The Laws of Table Tennis - are the same for both amateurs and professionals, BUT for higher levels of play there are many additional Regulations which supplement these basic rules. How many of these additional Regulations are actually used will depend upon the standard of the competition being played, and whether the organisers have adopted all or any of them. But for now, let's just take a look at a few of the basic rules of table tennis which you'll need to know in order to play a game with your friends. (You may also need to know your table tennis terminology, so I've put together a table tennis glossary for you here). Is a game up to 11 points or 21 points? Up until 2001 a table tennis game was played up to 21 points. But in order to make the game more exciting, have more "crucial" points, and to make it more appealing to television viewers, the rules of table tennis were changed. A game of table tennis is now played up to 11 points. 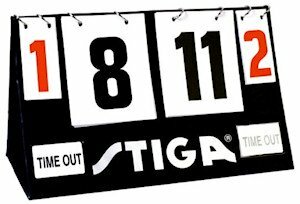 The winner is the player or pair who first scores 11 points, unless both players or pairs score 10 points (called deuce). Then a game will be won by the first player or pair to gain a two point lead. Before you start a game, you'll need to decide who's going to serve first. If you're just playing a game with friends, you can use whatever method you like to decide this, but the official rules of table tennis say that it's decided by lot, usually by tossing a coin or disc having two distinct sides. However, a common method used at lower levels of play is for one player (or the umpire) to hide the ball in one hand, then put both hands under the table or behind their back, and then ask the opponent to guess which hand the ball is in. If the winner chooses a particular end of the table, his opponent then has the choice of whether to serve first or to make his opponent serve first. If the winner chooses to serve first, his opponent then has the choice of which end of the table he prefers to play at first. The rules of table tennis have been changed many times in recent years in relation to the service law, but for a casual game of table tennis it remains very simple. The ball must be above the level of the playing surface and behind the server's end line (or an imaginary extension of it). This essentially means that the server must stand behind the end of the table to serve. The basic serve involves holding the ball in the palm of your non-playing hand and throwing it upwards. As the ball is falling, you must hit it with your racket (also known as a paddle or bat) held in your playing hand so that it bounces once on your side of the table, and at least once on your opponent's side of the table. If your opponent allows the ball to bounce more than once on their side of the table, they will lose the point. The ball may bounce anywhere on both sides of the table and, unlike tennis, you don't have to serve to one part of the table - unless you're playing doubles. If the ball touches the net and still bounces on your opponent's side of the table, the service must be replayed. However, if the ball touches the net and does not bounce on your opponent's side of the table, the server loses the point. The ball is "in play" from the moment that the server deliberately throws the ball up. For a more in-depth look at the service rules, take a look at my article here. Here's a video which explains the basic table tennis service rules. Prior to 2001 when table tennis was played up to 21 points, the rules were essentially the same, but each player had five consecutive serves and deuce was at 20-20. At deuce, service alternated until one player or pair gained a two point lead. But after the rule change in 2001, the number of serves that each player had was also changed. Now, each player has two serves each and service continues to alternate between opponents until one player scores 11 points, unless both players or pairs score 10 points (called deuce). If both players reach 10 points, then service alternates after each point, until one player gains a two point lead. Your opponent must hit the ball back over the net so that it bounces only on the server's side of the table and the ball must bounce at least once on the server's side of the table. If you allow the ball to bounce more than once on your side of the table at any time, you lose the point. When returning the serve, or during a rally, if the ball hits the net but does not hit your opponent's half of the table, then a point is awarded to your opponent. However, if the ball hits the net but still goes over and bounces on your opponent's half of the table, the rally continues. The receiver can stand wherever they want and can play their returns from any position. However, players are not allowed to touch the table with their free hand (the hand not holding the racket) and they are not allowed to move the table. If the server imparts backspin on the ball which causes it to go back over the net towards the server after bouncing on the receiver's side, the receiver must still hit the ball before it bounces on the server's side of the table. This means that the receiver will need to go beyond the net to play a stroke. If the receiver does not hit the ball before it bounces back on the server's side of the table, the receiver loses the point. Whilst a rally is taking place, and a point is in the process of being decided, both players can stand wherever they want and can play their shots from any position, including beyond the net on their opponent's side of the net. Therefore, if a player imparts backspin on the ball which causes it to go back over the net towards them, the receiver must still hit the ball before it bounces on the other side of the table. This means that the receiver will need to go beyond the net to play a stroke. If the receiver does not hit the ball before it bounces back on the server's side of the table, the receiver loses the point. When playing doubles, each player still has two serves and the service still alternates every two points between teams, but it also alternates between players on the same team. At the end of every two points, the receiving player becomes the server, and the partner of the serving player becomes the receiver. The service itself is exactly the same as in singles except that, rather than the ball bouncing anywhere on the table, it must bounce only on the right half portion of the table for both the server and the receiver. The receiver returns it, then the server's partner must hit it next followed by the receiver's partner and so on. Play must continue in this sequence throughout the rally and if a player hits it out of turn he loses the point. 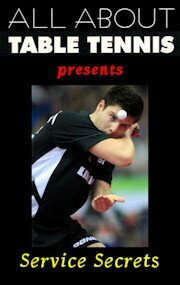 For a more in-depth look at table tennis doubles rules, take a look at my article here. To score a point, you must keep the ball in play longer than your opponent. As we saw earlier, when one player has scored 11 points (or when one player has a two point lead if the score previously reached 10-10), he wins the game. However, there is a time limit on how long a game can last. This is known as the Expedite rule and comes into operation after 10 minutes of play - unless 18 points have already been scored. The players then swop ends and the next game begins with the player who served second in the previous game. The rules of table tennis state that a match is the best of any odd number of games - usually 3, 5 or 7 games.